If you have been here before you will see that we are currently undergoing an extensive remodeling. We are no longer able to keep our pictures at Photobucket® and are transferring them to Imgur®. Due to our inexperience as well as other circumstances this is taking a while. But it is getting there a little at a time. We are also working on becoming mobile friendly. This is requiring a lot of experimenting and a lot of changing things around. Gemstone Jewelry is necklaces, bracelets, earrings and a few other items created primarily from chip and shaped stones. You can chose from patterns we have put together or design your own. We also provide a list of the stones we have and their purported metaphysical properties. Peyote Stitch items include necklaces, bracelets, medicine pouches, lighter covers and hair wraps. Choose from our patterns or request for us to work on another pattern. Wood Carvings are hand carved and include moons with faces and hanging crystals, incense holders with either a fist, a human skull or a cow skull, dragons, unicorns and whatever else I may be inspired to carve. 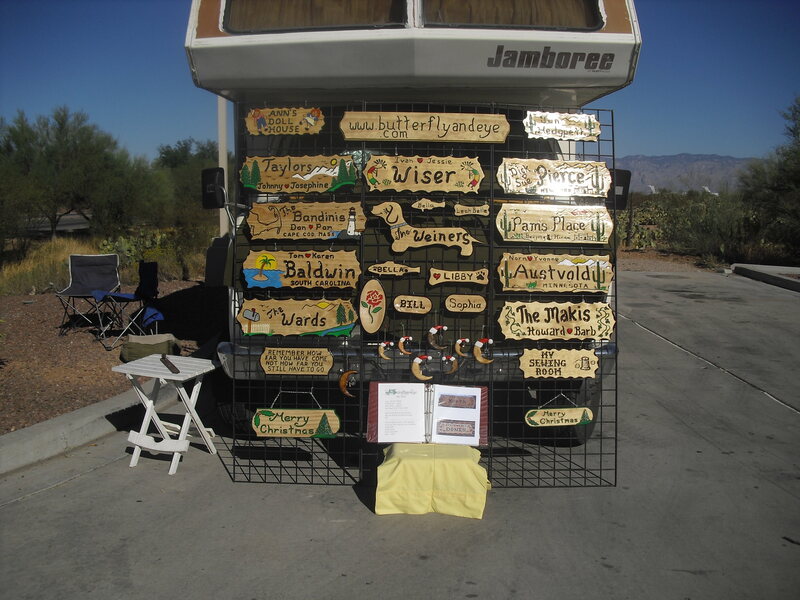 Wood Signs are mostly custom order. Order from our patterns or request a design of your own. Gallery consists of items we have made and either sold or kept for personal use. You may request from what you see here. Desert Herbs are herbs which grow in the Sonoran desert around Tucson. We offer them for both herbal and metaphysical purposes. Our "Blog" contains a journal of our travels beginning with hopping trains and hitchhiking and later in a van which was given to us. In our travels we visited all the lower 48 states. There are also short essays mainly related to religion, especially Wicca/Paganism. Notice that by visiting our blog you will be leaving this site but there are links back to this one.